Handsaw medallions, also known as label screws, come in many different forms. My Saw Medallion Reference Guide shows images of over 200 different saw medallions from eight different countries. 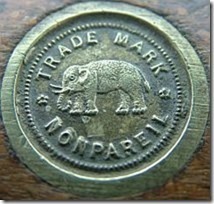 The most striking thing about medallions is the cast, stamped, or engraved images they display. Many saw medallions could be considered small works of art. Figure 1. Some saws, like the Disston No. 99, had multiple medallions. While the images on medallions cover a broad range of subjects, many include animals. 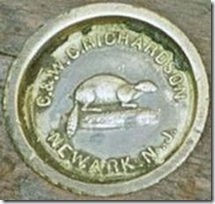 As a retired wildlife biologist, the images of animals on saw medallions naturally draw my attention. As one might expect, the animals displayed on medallions are often fierce, swift, or sharp-toothed. By using these images, the saw maker conveys an unspoken message that his saw will be sharp and cut quickly. 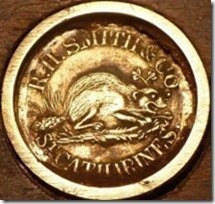 Sometimes, however, the animals shown on saw medallions are of the fat, slow, meek, or even slimy variety. I won’t hazard a guess as to the message these saw makers were attempting to convey. Let’s have a closer look at this broad range of animals on medallions. Nothing is more American than the eagle. This bird is by far the most common animal on saws made in America. 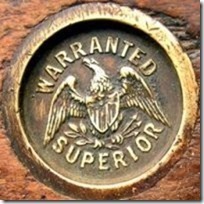 The ubiquitous Warranted Superior saw, a second quality saw produced by several different manufacturers, displays an eagle on its medallion. Perhaps this was to signify that the saw, even though second quality, was still up to American manufacturing standards. Figure 2. 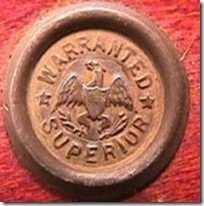 American Warranted Superior medallions came in several different styles. Warranted Superiors were not the only saws to display the eagle, though. 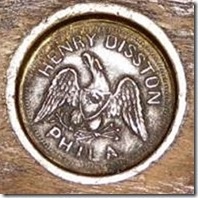 Prior to about 1865, Disston saws also had eagle medallions. Other manufacturers, such as Woodrough & McParlin, C.E. Jennings, L. Wheeler, J. 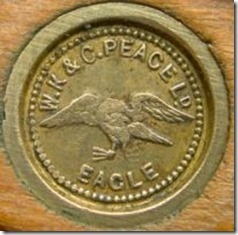 Flint, John Binghurst, E.F. Decker, Johnson & Conway, Slater & Gamble, and William Toland also used the eagle on their medallions. 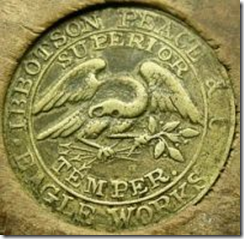 There is a common myth that the eagle medallion faced right on saws made during wartime periods and faced left during times of peace. This is, apparently, nothing more than myth. Figure 3. 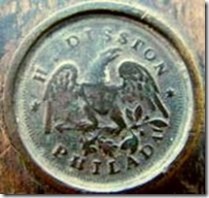 Disston medallions showing left and right facing eagles. One would not ordinarily associate Britain with the eagle image, but the British made many saws for export to America in the 19th Century. 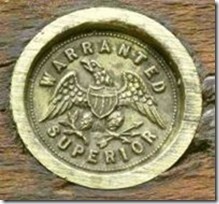 The wisest of these British saw makers used an eagle on their medallions to appeal to the American market. Figure 4. Examples of British eagle medallions. 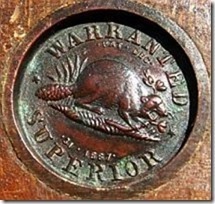 The beaver is probably the second most common animal image on saw medallions. I assume the connection here is that beavers, like saws, use their teeth to cut wood. The beaver is also known as an industrious animal (i.e. eager beaver), and we want our saws to be put to industrious use. Beavers are the Canadian national animal, and they appear often on Canadian saws. The beaver also appears on British saws, and possibly this was a sales technique for saws made for export to Canada, similar to the use of eagles on saws exported to America. 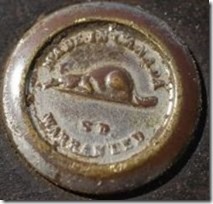 At least one U.S. saw maker used the beaver on their medallions. Figure 5. 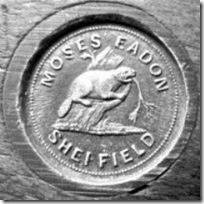 An American and two British beaver medallions. 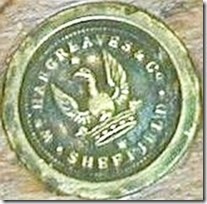 The British saw maker Slack Sellars used a bird on their medallions that appears to be a swift or perhaps a swallow. I recall once seeing a picture of a saw medallion that contained a wren, but I unfortunately didn’t save that image and now I can’t recall whose saw it was on. Figure 7. 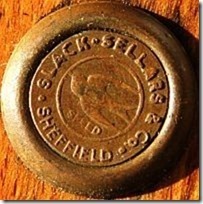 Slack Sellars medallion. 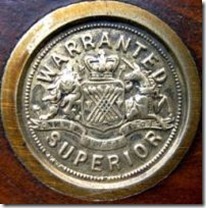 The British version of Warranted Superior saws displays an image that is very similar to the Royal Coat of Arms of the United Kingdom. This image contains a lion and a unicorn (More on the unicorn in the Mythical Animals section below). 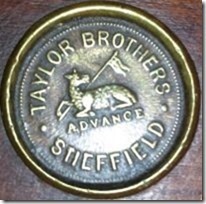 Several British makers used this same image on saws branded with their names. 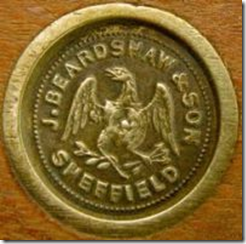 This includes Beardshaw & Son, Fenton & Marsdens, Ibbotson Brothers, Charles Callow, W.H. Armitage, and Marshes & Shepherd. Interestingly, J. 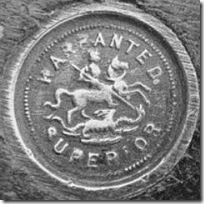 Flint saws made in Canada and the Warranted Extra saws made by the Canadian company Shurly Dietrich also used an image similar to the British Royal Coat of Arms. 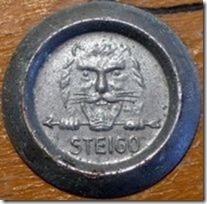 The American hardware company Lockwood, Leutkemeyer, and Henry and the German company Steigo also used a lion image on their saw medallions. Figure 8. 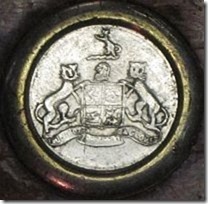 British, American, and German medallions displaying a lion image. British saws made by Robert Sorby displayed a kangaroo image. Presumably this is because Sorby exported a lot of saws to Australia. 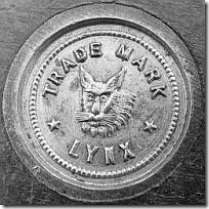 Other British saw makers used the image of a lynx (E. Garlick & Son) and an elephant (W. Tyzack, Son & Turner). Figure 9. Sorby, Garlick, and Tyzack medallions. Saws produced by the British maker Taylor Brothers bore an image of perhaps the meekest of all animals, the paschal lamb. A few British saws carried medallions with the image of Saint George mounted on horseback and slaying a dragon. Figure 10. Paschal lamb and St. George slaying a dragon from horseback. 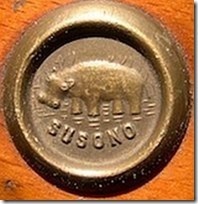 A hippopotamus is proudly displayed on the German Susono saw medallion. Susono means hippo in an obscure African language, and it also is a city in Japan. How it came to be shown on a German saw is anybody’s guess. Figure 11. German Susano saw. 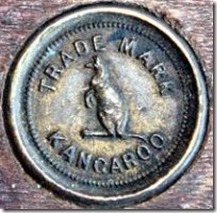 Birds and mammals aren’t the only animals to appear on saw medallions. 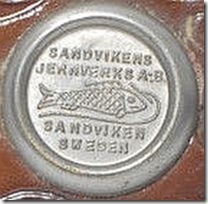 The Swedish saw maker Sandvik includes a fish on their medallions. 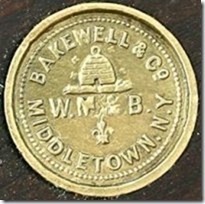 The American Josiah Bakewell’s medallions display a beehive with bees swarming around it. Figure 12. Sandvik and Bakewell medallions. I’ve already mentioned the unicorn appearing on saws with the British Royal Coat of Arms. The unicorn stands for Scotland, whereas the accompanying lion stands for England. According to legend, a free unicorn is a very dangerous animal; hence the unicorn in the image is bound by a chain. Likewise, the dragon being slain by Saint George mentioned previously is an example of mythical animals displayed on saw medallions. 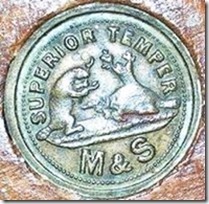 Saws made by the Atkins company (Phoenix Warranted) in America and Hargreaves & Co. in Britain bear the image of the mythical phoenix bird rising from a crown. The significance of the crown is unknown. Figure 13. 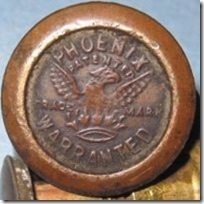 Phoenix Warranted and Hargreaves medallions. Finally, the medallion of the American company G.H. Bishop bears the image of a winged greyhound. Their saws presumably fly through wood with great speed. Figure 14. G.H. 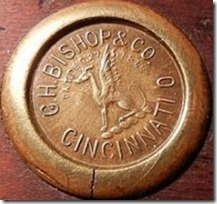 Bishop medallion. The importance of animals in our daily lives is undisputed. Saw makers around the world, for more than 200 years, have incorporated their love and respect for animals into their craft. The variety of animals depicted on saw medallions is not only interesting, but in many cases provides us with miniature works of art. These medallions, and the saws on which they are found, are well worth preserving for future generations to enjoy.